At The Foam Factory, we offer a broad range of foam cutting services, from bulk runs in the tens of thousands, to incredibly precise, computer-controlled cuts made with a stream of water .005 inches in diameter. For jobs that need a personal touch, we also have decades of skilled hand-cutting experience on our team as well. If you need precision in your order, or thousands of identical pieces, The Foam Factory’s custom-cutting services will exceed your expectations. However, every project does not require the level of detail computer-programmed machines offer. 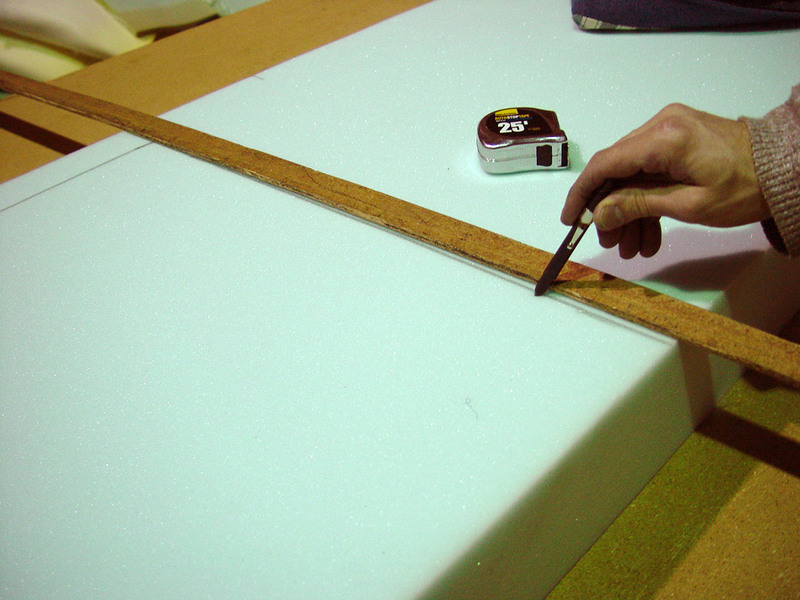 Many common tasks only require a couple straight cuts on a smallish piece of foam. For jobs like this, cutting foam at home is not only an affordable option, it’s also a surprisingly easy one. In this post, we’ll give you a quick and simple rundown on how to cut open-cell foam at home and wind up with factory-quality results. Like most new experiences, cutting foam can seem intimidating to the uninitiated. The last thing anybody wants to do is accidentally ruin a brand-new foam insert or mattress topper. While understandable, this reluctance is actually unfounded, as the reality of the situation is that cutting foam is incredibly easy. Sliced bread is a fitting analogy, as cutting bread is a great way to think about cutting foam. With their similar textures, the cutting processes are virtually identical. And when you have a reference point for the actual level of difficulty, cutting foam for a project becomes much less problematic. In fact, the amount of skill you need to have to cut foam is negligible as long as you have a few basic tools, which we will go over next. The top priority when preparing to cut foam is a flat cutting surface that won’t be damaged. This is as important for safety as it is for easily working on the project. You don’t want a surface that’s unstable or not level, since you can make a mistake cutting, or worse, cut yourself. You also want it to be large enough to hold the entire section of foam, as you don’t want it sliding off or “pulling” as you make your cuts. Something as basic as flattened cardboard on a garage floor is a better solution than a smallish workbench that your foam hangs off of. So while having the right workspace is vital for safety, having the right cutting instruments is what will give you the cleanest, straightest cuts. There are only two types of knives you should use to cut foam; both will need to be as sharp as possible, but neither should feature a flat, straight blade. Option one is a serrated carving/bread knife. As mentioned earlier, cutting foam is essentially the same as cutting bread, so it only makes sense that you would use the same type of knife as well. When using a serrated blade, make smooth and gentle back-and-forth cutting motions through the foam. 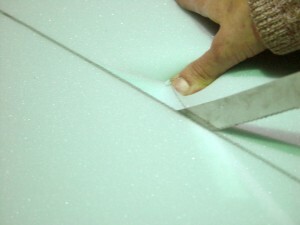 Let the cutting motion and sharpness of the blade work through the foam, not applied pressure. Starting at an edge of the foam and cutting slowly at a 45 degree angle with a serrated blade can give you a perfectly flush edge you probably didn’t think was possible at home. The other cutting style is a bit surprising to some people, but it works wonderfully. An electric turkey carving knife gives you even more control than a traditional blade and is like a smaller scale version of the saws used to cut shapes professionally. Just like when cutting with a standard knife, let the blade saw its way through the foam, rather than forcing it through with pressure. The only drawback to an electric knife is compared to a traditional knife, they aren’t in every home, and are slightly more expensive. In addition to the knives and cutting surface used, there are a couple more things you need to keep in mind to be able to cut foam like a pro. The first thing to keep in mind is that you should never compress foam in an attempt to make a fast cut. Doing so results in uneven pressure that translates to a wavy, jagged edge when released. Cutting slowly with fully expanded foam only takes a couple minutes longer and is definitely worth the straight edges you’ll ultimately end up with. The other item involves cutting when you are following traced lines. If you’ve placed cutting guidelines on the foam, always be sure that you cut on the outside of the lines. One, because a slight over-cut will compress into its case and look full, and two, an under-cut is a mistake you can’t undo. Over-cutting means you can always trim a little bit more off if needed. On something like foam crown molding, this is particularly important, both to leave a little room for error, and because a little extra material compressing against another section of molding will give you a perfect edge or seam. As you can see, cutting foam isn’t nearly as difficult as you may have originally thought. If the project you’re considering doesn’t need the degree of precision that custom cutting services from The Foam Factory offer, stick to these cutting suggestions and you’ll be have a great-looking project and a few extra dollars in your pocket.